Music triggers emotions of safety, comfort and love…all enhancing emotional, physical and mental child development. As a parent, you want the best for your baby. You read all of the parenting publications to help you prepare for your little one's arrival. Research has shown that music can play an integral role in the development during the pregnancy, as well as after the birth of your little one. 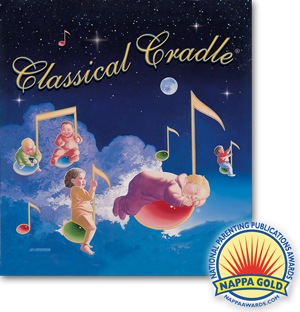 Classical Cradle® is dedicated to parents-to-be, new parents, grandparents and, of course, your new little bundle. The classical piano music medleys on this NAPPA award-winning CD have been arranged with you in mind. For baby to soothe, comfort, and lull to sleep. And for parents…serenity. Listen to it. Enjoy it. “Tranquil and beautiful. I let my patients listen to it in the waiting room.” ~ Dr. Vitagliano, D.D.S. Classical Cradle® Respects Your Privacy: ClassicalCradle.com respects your privacy. We will never sell or give any identifiable information about you to any third party without your approval. If you e-mail comments to ClassicalCradle.com, we may use your comments for editorial purposes or in promotional advertising and/or marketing materials.